The apartment, really close to Piazza Amedeo, has six beds and offers all the necessary comforts for a pleasant and relaxing stay in the heart of Chiaia district. The main spaces are: two cozy private bedrooms; a spacious sitting room with a sofa bed; a bright kitchen and a bathroom. All of the interiors are well-finished and - finding the right balance between rustic, elegant and modern - distinguished by the usage of wood as main element of the house. The apartment of 95 square meters, which is located on the fifth floor of the ancient building "Acquaviva-Coppola", has recently been renovated and stands out for some peculiarities, such as: a wide service entrance in wood and marble; parquet floors in all of the rooms and old windows decorated with carved wooden frames in both of the bedrooms. Beyond the doorway you're going to find a royal style space with an elegant mirror, a coat hanger and a vintage marble console where you can leave your belongings. From here, then, there is the largest room of the apartment: the sitting room, which, including a double sofa bed, flat-screen TV, Wi-Fi and gorgeous furniture, is thought as a relaxing space where you can rest after visiting Naples. Next to the living room there's the sleeping area, where we find two private bedrooms that, for elegance and comforts, look like real hotel rooms. Both spaces, indeed, have their own private dimension and are equipped with all the essentials: wardrobe, chest of drawers, desk, free set of towels, complete set of bed linen, extra blankets, spare pillows, table fans and even a luggage rack. Kitchen and dining room are also accessible from the sitting room and here we have an "L" shaped counter top with gas stove, sink, shelves and small electrical appliances for quick preparations: breakfast in the first place. However, there's also everything you need for cooking (crockery, pots, pans and utensils) in case you would like to cook delicacies with local products. The rustic-style dining table is in the same room and is large enough to accommodate up to six seats. Here you're going to find the perfect stay you've always desired and therefore we are looking forward to have you as guests! For each guest there will be an hotel treatment, as they will be provided individually: a free set of towels, slippers, ear foam tips and personal soaps for the bathroom. There's no air conditioning in the apartment, but this is not a huge problem because all of the rooms are very cool even in summer. Furthermore, we provide table fans in every room. During the whole stay I will be willing for any of my guests requests, explanations on the apartment appliances or general emergencies. It will also be a pleasure for me to suggest some tested itineraries that will allow you to better visit the city in short time, without missing anything. Indeed every guest will be given a brochure with helpful tips for visiting Naples and suggestions for places to eat. I will be more than happy to accomodate any other specific request not explicitly written above, so feel free to contact if you need. * As soon as your reservations is confirmed you will be given a telephone number to get in touch with me for any questions or requests. * According to the national laws, on arrival you will be asked to sign a "Lease Agreement Contract" for the whole stay in the apartment. Therefore will be required a valid ID for one or more occupants. * In the same place will also be issued a receipt reporting the period of the stay, the number of participants and a detailed summary of costs. * You will receive one or more decks of keys depending on the total number of guests. * Please note that according to the Municipality of Naples, every guest (excluding children under 18, handicapped people or who's renting the apartment for work) shall pay an extra fee of 2€ per night. This destination fee has to be paid only if the booking platform does not request it in advance during the reservation’s checkout. * The apartment is not provided with air-conditioning, but only with table fans available in every room. The house, anyway, is always cool also during summer. Check-in and check-out times are flexible only if there aren't other guests arriving or departing that same day. It is, however, always allowed to leave the luggage in storage. HOUSE RULES - READ CAREFULLY! All guests must show up at the arrival. All people, including children and infants, will be counted in the total number of occupants, therefore the price for the whole stay will be adapted accordingly. It is strictly forbidden to invite guests unrelated to the reservation to stay overnight. Any kind of transgression will be punished according to the law. Due to its location in a residential district there are many elderly living in the building, therefore you are asked to behave respectfully. Moreover, you must be quiet from 10 pm to 8 am with specific attention when you are in common areas. The apartment must be left tidy and clean, with no dishes to wash, any sort of damage or dirt that couldn’t be considered as the result of a “normal usage” of the spaces, otherwise you could be charged for cleaning costs up to a maximum of 50€ per stay. Finally, in rare case of damages or theft, you’re going to be asked for a compensation up to a maximum of 200€, as stated in the “security deposit”. Please note that according to the Municipality of Naples, every guest (excluding children under 18, handicapped people or who's renting the apartment for work) shall pay an extra fee of 2€ per night. This destination fee has to be paid only if the booking platform does not request it in advance during the reservation’s checkout. For security reasons the following areas (apartment’s doorway, building interiors and building gates) are under video surveillance. Video-recordings may be used to check if one or more of the house rules have been broken (e.g. hidden additional guests). Don’t worry! Your privacy is guaranteed: only common areas are under video surveillance, but, of course, the apartment is at your complete disposal and free from any form of control. My name is Francesco and I live in Naples. I am at my first experiences as a host, and it will be a pleasure for me to make your stay unforgettable. In fact, throughout your stay, I will remain at your complete disposal for any doubt or explanation and I will also be ready to provide advice or guided itineraries on how to better visit the city. I decided to rent this property because it is my interest to meet tourists from all over the world, offering, at the same time, a great quality service. Naples is wonderful city, but, sometimes, has a bad reputation. My intent is to show you its wonders and give you great suggestions, in order to visit it like locals. HOUSE MANUAL - ENGLISH BOILER, WATER and HEATING SYSTEM In the kitchen, hidden in a wall unit, there is the boiler that controls both the heating system (in every room there is at least one radiator) and the water temperature. On your arrival I will certainly provide more detailed explanations on its functioning, but here, however, I leave some basic instructions. Boiler Layout Opening the boiler door you’re going to find two white control knobs. Both of them have different functions and have to be adjusted carefully. * Upper Knob: Adjusts the boiler "program". * Lower Knob: Adjusts the water temperature. I recommend to set a water temperature that does not exceed 55 °C, therefore adjust the lower knob (number 6 in the image below) in a vertical position with the black dot pointing down. Upper Knob Programs * Set on Zero: Heating Turned Off, Hot Water Turned Off * Set on Summer (left, sun): Heating Turned Off, Hot Water Turned On * Set on Winter (right, snow): Heating Turned On (Lowest Temperature), Hot Water Turned On INTERNET, CONNECTIVITY and ELECTRONICS In the apartment you can connect to multiple Wi-Fi networks, all provided by Fastweb, under the name “FASTWEB-Bacchini”. The reason why there are various networks depends on their signal strenght, such as the “Extender” which is faster in the bedrooms. In addition to that, each room is equipped with Ethernet connection, allowing you to navigate at a higher speed. I will also provide a Pocket Wi-Fi (accessible with extra credentials) that will let you have internet on the go. In the living room there’s a FULL HD TV connected via cable on the national channels. The device has also HDMI and USB ports that will let you use it as an external monitor for multimedia or productivity. Finally, in the bathroom drawers there is a small Bluetooth speaker if you want to listen to some music during a relaxing shower. toilet, shower, bidet, Towels, soaps, detergents, hairdryer, first aid kit. For each guest there will be an hotel treatment, as they will be provided individually: a free set of towels, slippers, ear foam tips and personal soaps for the bathroom. The bathroom is supplied with everything: soaps (for hands, shampoo, bath foam, conditioner), toilet paper, towels, first aid kit, hairdryer and other accessories. On explicit request I can provide extra services for a fee, such as cleaning up the spaces during the stay or replenishment of specific products. In case of unpleasant smells, the aerator can be operated by switching on the main light, ie the wall light. The closest beach is Mappatella Beach, but taking a bus you could reach also numerous other places where to spend a day at the beach, such as Gaiola or Posillipo. Chiaia District is one of the most elegant and safe of the city. Here you're going to find a lost atmosphere, extremely fascinating and joyful at the same time. Just on the seafront you're going to find a lot of restaurants where to have a dinner at late in the evening. I will be more than happy to provide numerous suggestions on what to visit or where to eat. Just on the beach you can rent a rowing boat to explore the gulf of Naples from the sea. The seafront is really close to the apartment. You can get there on foot in just 5 minutes. It is highly recommended watch the gulf of Naples from there at the sunset. In the second bedroom you're going to find a vintage-looking telephone. It doesn't work anymore and it's there just for aesthetical purposes. WARNING: There's no air conditioning in the apartment, but this is not a huge problem because all of the rooms are very cool even in summer. Furthermore, we provide table fans in every room. The whole house is equipped with central heating and every room is provided with at least one radiator. On the spot I will provide instructions on its functioning. All beds are provided with clean and pressed before your arrival. We also supply extra sheets on request. The washing machine is free and it's in the living room, hidden in a wall unit. On your check-in I will provide further instructions on its functioning. Please, read carefully the manual. The dryer machine is free and it's in the living room, hidden in a wall unit. On your check-in I will provide further instructions on its functioning. Please, read carefully the manual. There's a private parking in front of the apartment. Prices should be 25€ per day. There's no need to make a reservation, but, if you want, you can pay in advance via parclick.it. Write if needed. We provide two Wi-Fi networks, a fast Ethernet connection in every room and also Pocket Wi-Fi to be connected on the go. All the password and instructions are written in the guest book. For each guest there will be an hotel treatment, as they will be provided individually a free set of towels (hands, face and body). Extra towels or sheets are available on request. All the rooms are equipped with high-speed ethernet connection, up to 1 Gigabit per second. The sitting room, which, including a double sofa bed, flat-screen TV, Wi-Fi and gorgeous furniture, is thought as a relaxing space where you can rest after visiting Naples. The refrigerator, also equipped with a freezer compartment, is always on and does not need any type of adjustment. You will also find ice-cubes and welcome cold drinks for free. The hob is new, purchased in February 2018, therefore almost never used. Very convenient for cooking local food or making coffee the "Neapolitan way". Please, clean it after your stay if dirty. The microwave automatically goes into stand-by and to be switched on, keep the "on" button pressed. On the spot I will provide explanations on its operation. It's ideal for heating food or beverages. The coffee machine can store a maximum of 5 tablets, so it has to be cleaned before making new coffee. We also provide a vintage-looking electric toaster, ideal for preparing a quick toast in the morning before heading out to explore the city. In the kitchen you will find sugar, salt, coffe and other spices. I also supply basic food items for free like pasta, oil, vinegar, bread and sauces. You can arrange a quick meal if you want. The kitchen is equipped with everything: pots, cutlery and crockery. There are saucepans for every eventuality: wok, plate, cast iron and so on. Just open the drawers and you're going to find them. In the kitchen you will find small appliances ideal for quick preparations, such as heating drinks or food. We are providing an electric kettle, a toaster, a microwave oven and a coffee machine. The dining room is in the kitchen and the rustic wooden table can accommodate up to six people. If you need extra chairs, feel free to take the ones in the living room. Treat them carefully, please. The FULL-HD TV is also equipped with HDMI and USB ports that will let you use it as an external monitor for multimedia or productivity. The FULL-HD TV is connected via cable on the national networks. If you want you can set your preferred language. In the bathroom drawers there is a small Bluetooth speaker if you want to listen to some music during a relaxing shower. Note that it may be drained. In the apartment you will find many books, focusing mainly on the culture of Naples and its traditions. Feel free to read them if you want. In the bedroom with the two single beds there are also some books for children, ideal for those families travelling with young kids. There are also many board games under the TV. In Piazza Vittoria, 600 m from the apartment, there is Villa Comunale (Public Park), the ideal place to relax in the heart of Naples surrounded by the tranquility of nature. Write me for info. The Kayak Napoli association in Via Posillipo, 68 offers a kayak hire service for the whole day at € 10. It can be reached by bus from Piazza Vittoria towards Parco Virgiliano. Write me for info. In Via Riviera di Chiaia 201, just 700 m from the apartment there's NapolBike, a venue offering bike rental for the whole day at 15€. Always call for availability. Write me for info. It is possible to rent a gozzo or a rowboat near the Ramaglietto Molo, next to Castel Dell'Ovo. The experience is very impressive and I recommend it to everyone. Write me for info. The nearest tennis club is Viale Anthon Dohrn, about 800 m from the apartment. It is always better to call to ask for availability. Write me for info. The Circolo Golf Napoli is located in Pozzuoli in Via Campiglione 11. The best way to reach it is by car, via the ring road. Write me for info. KITCHEN and SMALL APPLIANCES In the kitchen you will find small appliances ideal for quick preparations, such as heating drinks or food. We are providing an electric kettle, a toaster, a microwave oven and a coffee machine. All of the items are new and their functioning is very simple, so I will not go into particular explanations except that the microwave goes automatically on stand-by and has to be turned on by pressing the on/off button. It is also useful to mention that the coffe machine can store up to a maximum of 5 tablets, so it has to be cleaned before making new coffee. The fridge is already set to the “minimum” temperature, so there’s no need to adjust the valve inside. An higher number indicates that the temperature is lower. The room is also equipped with utensils, dishes, pots and pans that are stored in the drawers. In the wooden pantry, finally, you will find essential things for a simple breakfast (jams, teas, spreads, biscuits…) and basic goods (oil, pasta, sauces…). This Napoli apartment is spectacular and charming! Francesco’s apartment is the best VRBO I have stayed in. He is an absolutely wonderful host who is passionate about making his guests feel both welcome and at ease. The apartment is spacious and beautifully decorated. You will have everything you need and more if you choose to stay here. The location is conveniently located near transportation, restaurants, shops, and sights. It was difficult to leave the apartment, but there are many things to see in Naples. Plan your trip today, and stay in Francesco’s amazing apartment! Thank you very much Carolyn. I hope to see you once again in the future. Greetings from Naples. Great apartment and wonderful host! A group of friends and I stayed at Francesco's apartment for a week, and used it as a base for excursions in and around Naples, Pompeii, and Amalfi Coast. It was our first time visit. The apartment is charming, newly renovated, super clean and well furnished, and stocked with essentials like a mini coffee machine and small fridge. And it also has a washer and dryer - something we didn't expect to use but became very handy. The location is in a wonderful area that is convenient to train station and all the main must-see sites of Naples, as well as the main shopping street of the city; we easily walked from there to many destinations. There is even a small square - Piazza Amedeo - three minutes walk away, that has the best cafe and sfoglietella for morning coffee and pastry. Francesco was a great host and was very welcoming, including giving advise before and after our arrival, and during our stay. He explained everything in detail, as well as leaving a guide booklet in the apt, with neighborhood recommendations, wi-fi codes, etc. He even booked our transport to the airport when we needed a very early morning taxi. I'd happily stay at this apartment again in the future and high recommend it. Thank you Francesco! Thank you very much Augusto! I hope to see you once again in the future. An outstanding apartment with a wonderful host. 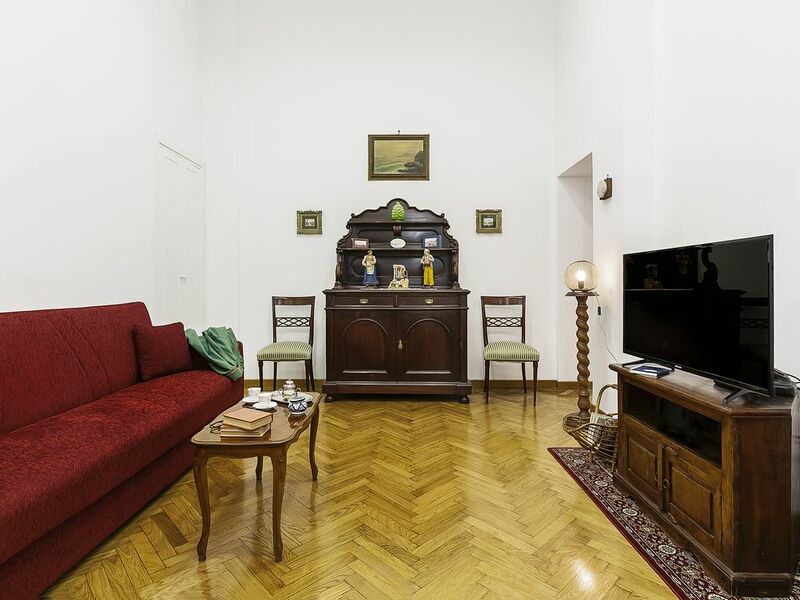 House Margherita is located in the bustling Chiaia area and within an historic palazzo having 15 foot ceilings and eight foot windows giving you a sense gracious space and of living in another era. The apartment itself is lovely and modernly appointed with a washer/dryer and a well equipped kitchen. This spacious apartment has tasteful and unique furnishings that add to the experience. You can walk to most of the city from here and public transportation is easily accessible. Francesco was extremely helpful and put together a complete book of places to see and how best to get there, as well as restaurants to try, he was easy to reach with any questions or requests. We used many of his suggestions and were always delighted. This was the last stop of a month long vacation and a wonderful way to end our trip. I highly recommend House Margherita. Thank you Francesco. Thank you very much Bonnie and Bill. I really hope to see you once again in the near future. Thanks again! We loved staying at Margherita Chiaia. It's very close to the train, funicular and a short walk to the port. Close enough to everything you need but far enough away from the very touristy area not to be overwhelmed by tourists. The house has absolutely everything you need and Francesco was great and so helpful. The decor is antique & very stylish. We'd totally recommend staying here. Thanks again. Have a nice vacation in Italy :). My mother and I greatly enjoyed our stay in Francesco's beautiful apartment. We were very impressed with the apartment and Francesco's attention to detail as a host. It is spacious and well-equipped with all of the amenities of a fine hotel and more. Also, the apartment is very convenient to shopping, dining, and public transportation- only a few minutes from the funiculare and the metro. We highly recommend this apartment to anyone visiting Naples. I hope to see you once again in Naples in the future. Terrific, newly refurbished property in a fashionable area of Naples. Great host! We had a great stay at Francesco‘s apartment. The place is beautiful, and very convenient, very close to the funicolare di Chiaia and the metropolitana. Also one minute away from the shops on via de Mille. The apartment is in a historic building but it has been just refurbished. Francesco was a great and very helpful host ... recommend highly! Thanks for everything. I hope to see you once again in Naples :). The apartment is located in the elegant Palazzo Acquaviva-Coppola built in 1912 in southern Liberty style, which is an artistic movement deeply influenced by the "European Floral Trend", developed in Naples mainly in the neighborhoods of: Chiaia, Posillipo and Vomero. The building has the peculiarity of having a double access, both from Via San Pasquale 48 (next to the Teatro San Carluccio) and Via Del Parco Margherita 12, where you can admire the yellow building in its entirety. Chiaia district, just beyond the public park (Villa Comunale) and the seafront (Lungomare), is always been considered as one of the richest and most elegant of the city. Therefore, here, you will find a lost atmosphere, really quiet, safe and fascinating at the same time. This line allows you to easily reach the Central Station Garibaldi [direction Gianturco], as well as the National Museum (Cavour Station) and the Old Town (Montesanto Station). Getting off at the last stop (Cimarosa) will let you reach Certosa di San Martino and Sant’Elmo Castle, located both in one of the highest point of the city, where you can have and an astonishing view of Naples. In Piazza Vittoria, just 5 minutes walk from the apartment, there's the bus station. From there you can take a bus not only for reaching other areas of Naples, but also for the main attractions outside of town, such as: Pompei, Mount Vesuvius or Caserta’s Palace. In Piazza Amedeo, just two minutes from the apartment, you can pick a cab to reach specific destinations late in the evening. In Via Del Parco Margherita you're going to find "blue parking spots" where you can leave your car paying the hourly ticket (also via apps like EasyPark and Tap&Park). Otherwise, if you're not going to find an empty spot, you can go to a private parking (3€ per hour or 20€ for the whole day) just few steps from the apartment. There's no need to make a reservation there, but, in case you want, you can pay in advance via parclick.it. Maybe just check for availability. * Car: 300 mt from the apartment, in Via Giovanni Bausan 16, there is a car rental agency, named Nobis Olimpia. * Bicycle: in Via Riviera di Chiaia, a few steps from the house, there is a bike rental (Napolibike) always open and very efficient. Prices should be around 15€/day per bike. * Rowing Boats: at the pier in Borgo Marinari, just 15 minutes walk from the apartment, it is possible to rent both rowing or motor boats to admire the seafront from the gulf. Another pier that offers this service is Mergellina harbour, just in front of Chalet Ciro. You can reach this place by taking the underground line 2 from Amedeo Station and getting off at Mergellina Station.